Apple iOS-Jailbreak community is anxiously waiting for an upcoming release of evasi0n7 iOS 7.1 Untethered Jailbreak for iPhone, iPad and iPod Touch devices but they have not achieved any success yet, But another Russian iOS-developer named "Smolk" has found a working method to Jailbreak & Install Cydia on iOS 7.1, iOS 7 Firmwares and Unlock iOS 7.1, iOS 7 Activation Lock. According to “Smolk”, A newly developed tool will allow users to Jailbreak iOS 7.1 with Cydia Installation & Unlock Remote iCloud Activation Lock Running on iOS 7.1, 7.0.6, 7.0.4, 7.0.3, 7.0 and below. Currently, this method will only works and compatible with Apple iPhone 4 and no other device i.e. iPhone 5S, iPhone 5C, iPhone 5, iPhone 4S, iPod Touch 5G, iPad Air 5G, iPad 4G, iPad Mini, iPad Mini 2, iPad 3G and iPad 2G is compatible with this tool. The tool is also compatible with Windows 8.1, 8.0, 7 and XP operating systems. NOTE: Apple iPhone 4 Smartphone user needs to make sure before implementing below tutorial and guide, Your phone must renamed as 'new device' via iTunes and your device password must be disabled. 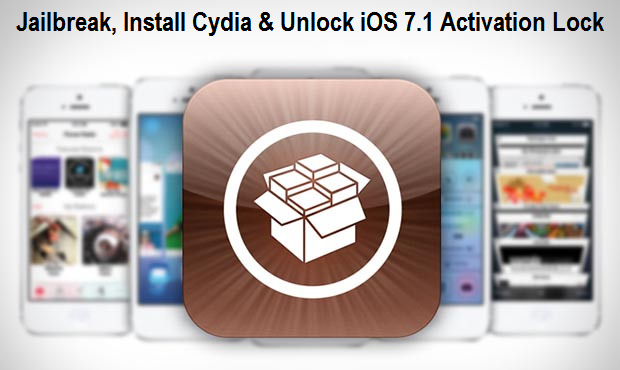 Step 1: First, Download required tool for iOS 7.1 Jailbreaking & Activation via Direct Link. Step 2: Connect your iPhone 4 to your PC / Laptop and launch the tool and select 'Tethered Jailbreak iOS 7 for iPhone 4'. Step 3: Now press the button '1) Run SSH_RD Tool'. Step 4: After that, wait for the window RD_tool to launch, and then switch your device into DFU-mode. Step 6: After that, select 'Jailbreak Data Send', and wait for the popup that says 'Continue connecting and add host key to the cache?'. Select Yes 'Y'. The phone will now reboot in recovery mode. Step 7: Now press 'Tethered boot iOS 7.1 iPhone 4 Model: 3.1 or 3.2 or 3.3' to boot the phone depending on your model; find the iPhone model with the image number in the window. Step 8: After downloading, don't do anything before the device automatically reboots. "Cydia" will be installed now. Step 9: Now you need to wait for respiring. This is when mobilesubstrate will be added. Step 10: Now you can open "Cydia" and install any updates. Congratulations!! You're done. NOTE: It's not an 'Untethered iOS 7.1 Jailbreak', so you need to connect your iPhone 4 to the computer and select 'Tethered boot iOS 7.1' upon every reboot.